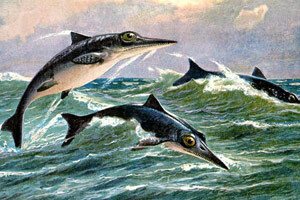 There were many different kinds of ichthyosaurs. The earliest were long and thin. They looked like lizards with flippers. They probably moved like eels. Over millions of years, ichthyosaurs changed. They looked more like fish or dolphins. Their flippers became stockier. 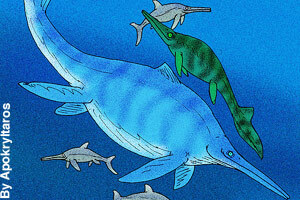 In general, ichthyosaurs had long, thin snouts. They had about 150 teeth. They used those teeth to eat squid and fish. As they became more tuna-like, they became faster swimmers. 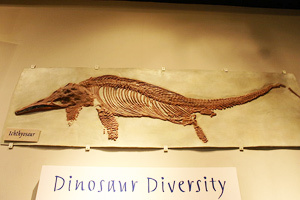 Some fossils show that ichthyosaurs had dorsal and tailfins. They probably used their flippers to steer, and their tail fins for speed. 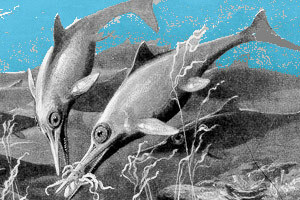 Ichthyosaurs had huge, flat eyes, up to 10 inches across. (That is the biggest eye of any animal ever.) The eyes had a ring of bone inside. It helped them keep their shape. That was important when the reptiles swam fast or dove deep into the sea. They probably did hunt in very deep water. Those huge eyes would have helped them to see in the dark. Some ichthyosaur remains were found with babies inside. That means they gave birth to live babies. They did not come up on land to lay eggs. They did not come up on land at all, though they did breath air. 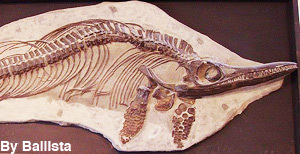 Pieces of ichthyosaur fossils were first found in the 1600’s. The first complete fossil was found in England by Mary Anning in 1811. MLA Style: "Ichthyosaur." Facts4Me. Mar. 2014. http://www.facts4me.com.